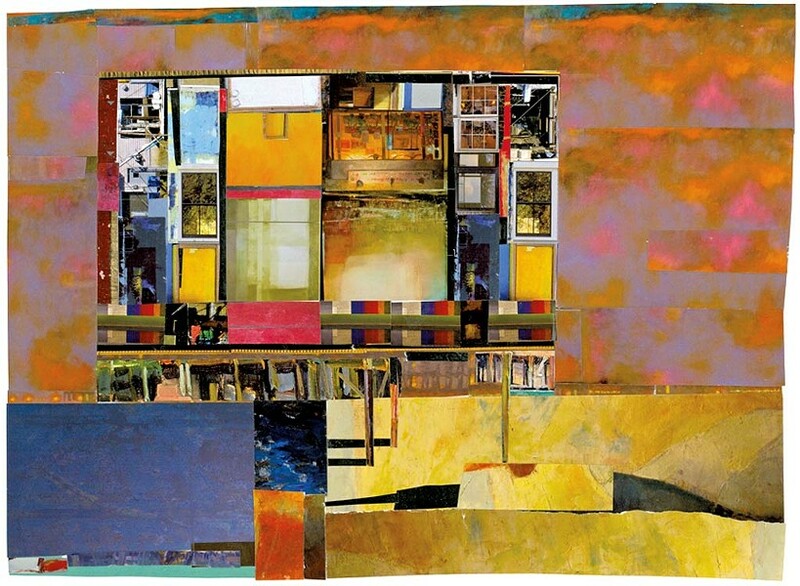 Norwich University's Sullivan Museum and History Center seems an unlikely setting for a show of abstract, colorful collages in the shape of small billboards. Arthur Schaller's "Billboard Buildings: Collage and Mixed Media" is situated amid permanent exhibits that go heavy on uniforms, weapons and other accoutrements of warfare. Adding to the incongruity, the museum's other temporary show, "1864: Some Suffer So Much," focuses on Norwich alums who ministered to the maimed as battlefield surgeons during the Civil War. Schaller's works thus form a peaceful oasis of aesthetic comfort. And it's not as though they randomly appeared on the campus of the oldest private military institution in the United States. The artist has taught architectural design at Norwich for the past 16 years, a lengthy stint in his 40-year academic career. Schaller's website says he has been "obsessively exploring collage environments assembled from printed surfaces and found materials." There is indeed a fixated, compulsive quality to these 30 or so pieces, which are mostly composed of thin, horizontal strips of printed matter glued onto boards. The artist explains that he works in series, producing variations on a particular concept or visual theme until he decides it has been exhausted. The show offers some visual variation in the form of a few wood constructions. These 3-D objects, which Schaller also made, are quite similar to his framed works hanging on the walls. One is hinged and opened to form a V-shaped diptych with abstract formations attached to its sides. It might be a devotional icon, or an expression of the artist's search for "balance between abstract formal two-dimensional composition and speculative spatial realism," as described in his artist statement. 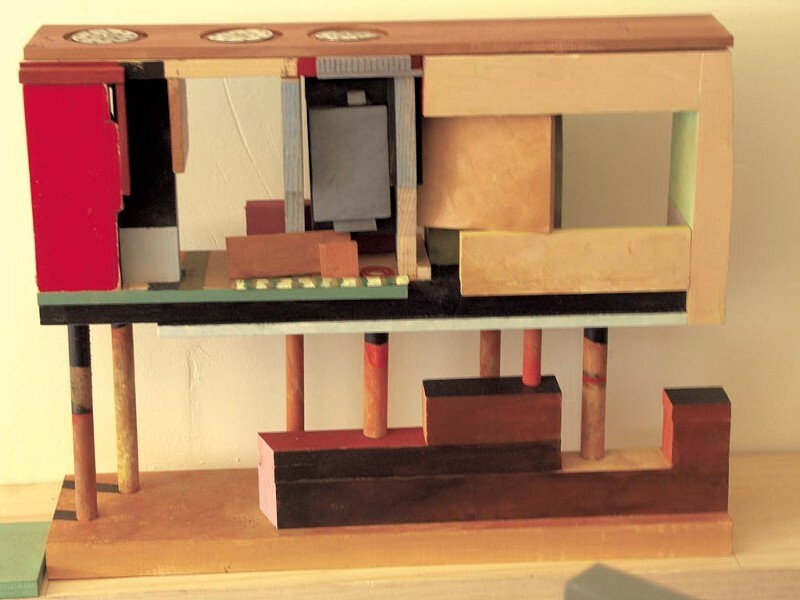 Identifying himself as "a bricoleur at heart" — that is, someone who works with found objects — artistically Schaller resides within a lineage whose luminaries include Kurt Schwitters (1887-1948) and Joseph Cornell (1903-1972). Schwitters, a German artist, is best known for his "merz pictures" in which images of items from commerce are given abstract arrangements. Cornell, a self-taught artist who lived as a recluse in Queens, N.Y., made mysterious assemblages with items found in local thrift shops. But those earlier artists' works often included images of familiar objects as points of reference. Visitors to the Sullivan probably wouldn't recognize Schaller's nonrepresentational arrangements as mini-billboards without the depictions of supporting poles that he includes with each image. His are signs that send no clear signal. And without any allusions to humans or the things they create, Schaller's "buildings" are both vivid and puzzling. The image fragments — torn from publications and reconstructed — remain enigmatic because they omit points of reference. A viewer must look closely to find images of recognizable objects from everyday life embedded in a few of Schaller's works. Raindrops are beaded on a glass surface in "Billboard Buildings #6," while '50s-era television sets appear in a couple of the works. And maybe that's a sailboat in a corner of "Beach Wall," which has grainy, sandpaper-ish elements but a distinctly un-beachy palette. "Havana Billboard #21" features neon streaks suggestive of nightlife in the Cuban capital. The mostly black background might be read as the darkness of the sea on which Havana sits — or perhaps is a depiction of the unlit streets in that impoverished city. The show includes an artist's statement stenciled on one wall. But Schaller's musings about buildings as metaphors aren't much help in elucidating the thinking behind the format he has chosen. A hint as to his influences and intentions emerges on the professor's personal website, where he likens his billboard buildings to "a modernist Baba Yaga's hut of sorts." Baba Yaga, a witch of Slavic fairy-tale lore, is also one of the many antagonists featured in the fantasy role-playing game Dungeons & Dragons. Her hut stands on stilts, which are actually chicken legs that enable the geometrically confounding structure to dance from world to world. Schaller's billboard buildings, by contrast, are pedestrian. They're often bright and occasionally vibrant, but they elicit no emotional engagement from viewers. Intellectually, too, these pieces seem to be in conversation more with the artist than his audience. The original print version of this article was headlined "Building Blocks"